Are you fed up with trying to view a locked Facebook profile image and photo? Some time on Facebook we find some images or photos that we really want to see in a larger view but unfortunately it’s not always easy to view every images in its original size. It’s because the profile image is locked by its user and when you click on the image to view it in a larger size then it’s not open because the pic is locked, but there could be a full image behind that short image. There are some smart Google chrome extension and Ad ons available for Facebook and Firefox which lets you see the full profile images on Facebook whether it’s locked or not you can always view any profile image or photos in a larger view. To use this tool you have to download or add a Google chrome extension or a fire fox Ad ons into your browsers. To add the extension and Ad ons just follow the steps below. 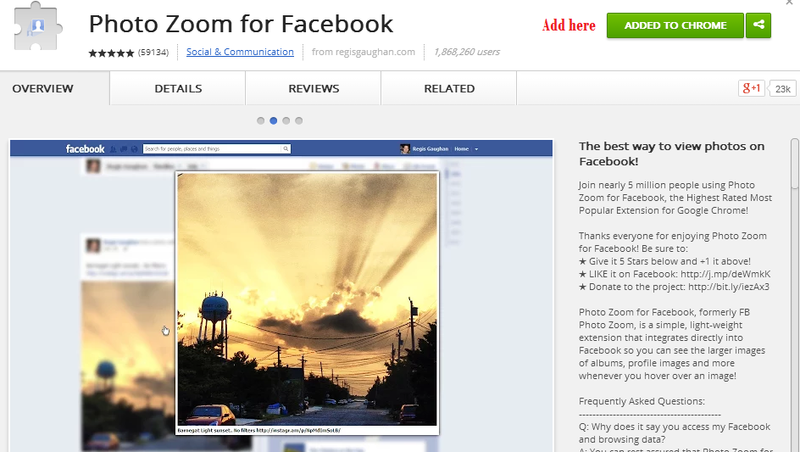 1- First go to Google chrome web store and add (Photo Zoom For Facebook) extension. 2- After adding the extension you can manually enable or disable it by going to setting in Google chrome. 3- To use this just enable it from the setting and you will see a photo zoom option on the right below side on your Facebook profile, just click on that option and the photo zoom for Facebook will be activated. Now you don’t have to click or open any pic to view it in a larger view, just hover your pointer on it and it will show you the image in a larger view. 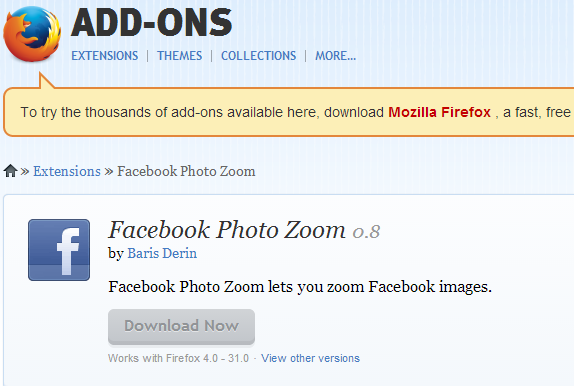 For Firefox just open the Firefox and download the Facebook Photo Zoom Ad Ons for Firefox. After adding the Ad Ons just enable it from the Firefox setting and that’s it, now it automatically show you the full size image whether its locked or not. Now after adding these extension and Ad ons you can view any image on Facebook in its original size. These extensions are really easy to use and helps every time when we really want to see a locked images, just take the mouse pointer on the image and it will show you the full image in its original size. If you have anything to ask just leave it in the comments below.